Eyebrows frame the face and we constantly battle with which product will perfectly groom our brows. Microblading can help if you have gaps in your brows, very little or fine hair. By using the microblading technique it can lift the whole eye area, it can create a beautiful arch and lift without the need for surgery. 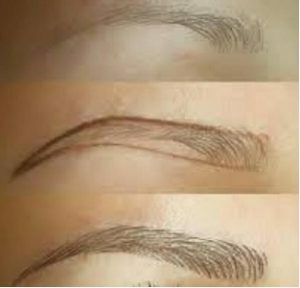 All clients eyebrows are different; some have a naturally good brow but want more definition, some have very little hair and need want a whole brow defining, this may be helpful for those who have alopecia or have undergone chemotherapy, and are wanting the most natural and beautiful looking brows. If you would like more information please call me and we can discuss the process and the best option for you. You can view more photos of the microblading eyebrows treatments I’ve carried out on my Facebook page. 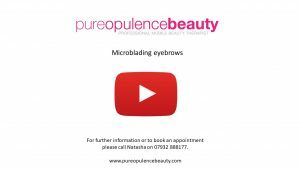 or click on the image on the right hand side to watch a microblading treatment.